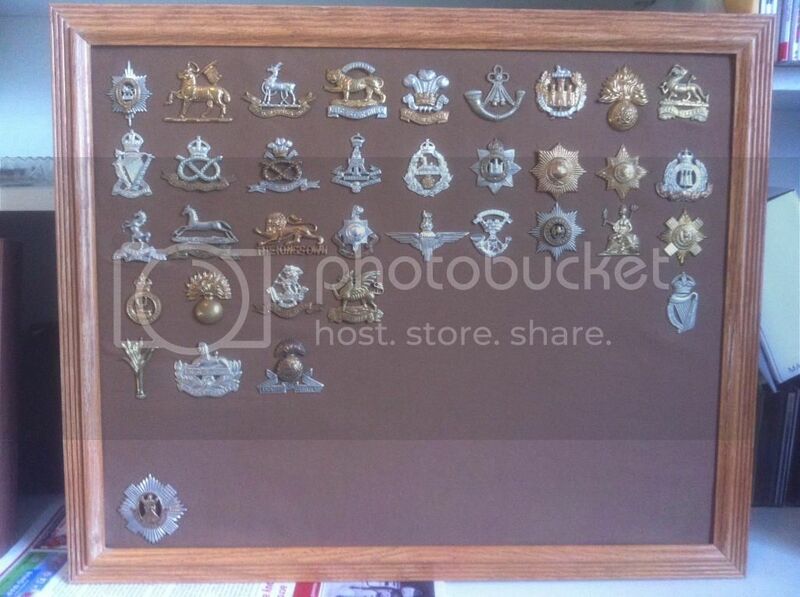 Other than antique guns, my other collecting interest is WW2 cap badges. British and Commonwealth militaries place a lot of emphasis on the cap badge - in the combat arms each regiment has their own distinct badge, and in the support trade every corps or service has their own as well. Your cap badge is the most visible identification of who you belong to and what you do - in the Canadian military, if we want to know where someone belongs, the questions is "What cap badge is he?" The whole thing started when I inherited my grandfather's badge - he was in the Royal Canadian Electrical and Mechanical Engineers, attached to the 1st Canadian Infantry Division in Italy and NW Europe. From there it just sort of snowballed, as these things tend to do with me! This is my (near) complete set of WW2 Canadian badges, for all the units that deployed overseas during the war. The maple leaf on top is the General Service badge, worn by all recruits until they were assigned to a unit. The first two rows are corps / service badges, the second cavalry units, and the rest are infantry. 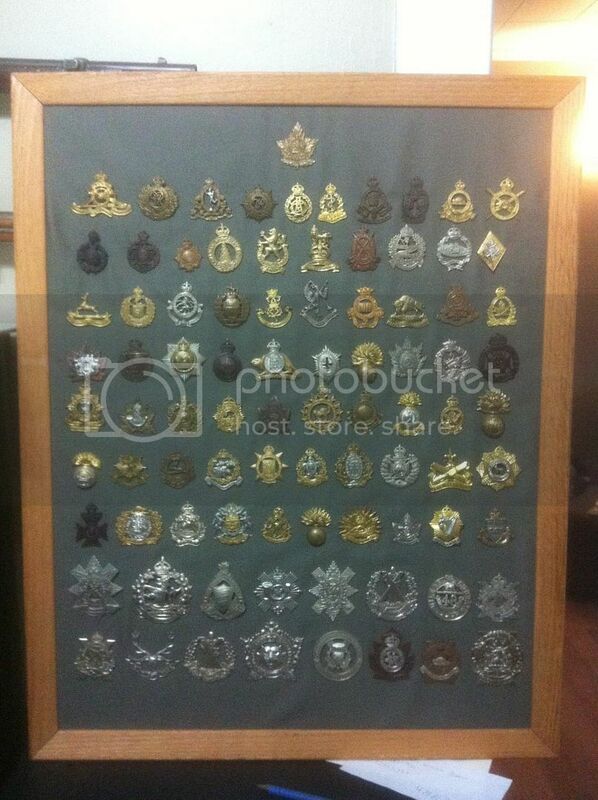 The two bottom rows with the larger badges are Highland regiments - because they wore the balmoral hat instead of the beret (or wedge cap before 1943), the badges are bigger. The Canadian Army in WW2 is interesting - we only had 3 regular Infantry regiments, and two Cavalry (converted to armored regiments in 1939) - all single battalion. Defence of Canada was intended for the Militia, which was made of up of all the other reserve regiments. During the war regiments raised overseas contingents, which became the 1st battalion of their parent regiment - the 2nd battalion staying at home to recruit and train a steady stream of reinforcements. Many of the infantry battalions were actually converted to armour to make up the shortages of tank crews - leading to some odd situations where a unit like the Duke of Connaught's Own Rifles were driving Shermans. Canada was also unique in deploying several French-speaking regiments - Most famously the regular army Royal 22nd Regiment (the Vandoos) but also several militia units. There were also a few interesting hostilities-only units, including the Sherbrooke Fusilier Regiment, formed when the French speaking Fusiliers de Sherbrooke, and English speaking Sherbrooke Regiment, each couldn't raise enough men to make up a full unit, so temporarily combined. Last edited by Nyles; 02-03-2015 at 01:55 AM. This is my (about 1/3 complete set) of British infantry badges. The British had a completely different way of organising, being a much larger army with constant Colonial commitments. Each regiment had two regular battalions and two reserve (Territorial) battalions - at any given time, one regular battalion would be at home and the other deployed to India or elsewhere. A few of the reserve battalions maintained separate identities for various traditional reasons, and there were a few "orphan" Territorial units from areas to small to have a regular battalion based there. Interestingly pretty much all of the British regiments of that era no longer exist, with only the 5 Guards regiments and the Parachute Regiment surviving - the rest of the old line infantry regiments have been amalgamated together into large regiments to save money over the years. 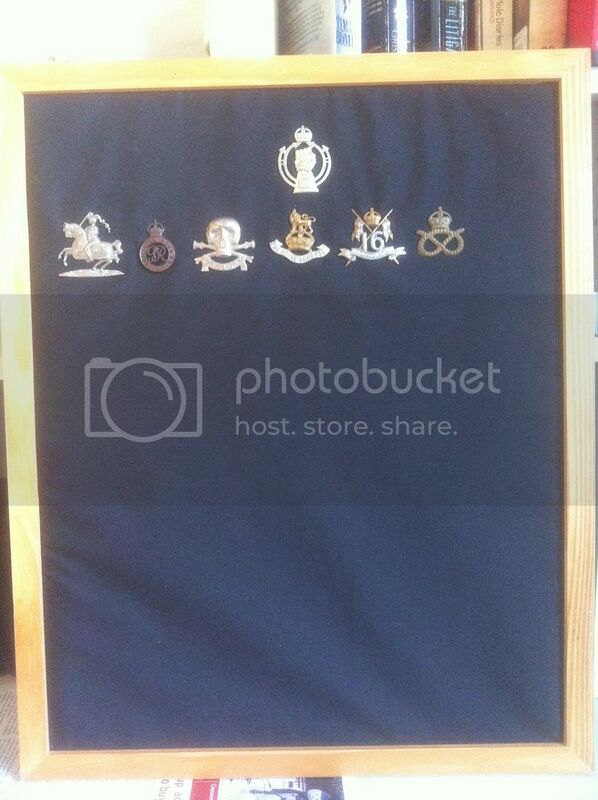 Again the big badges on the bottom are from Scottish regiments (only have one at the moment). Of particular interest for you guys would probably be the Parachute Regiment badge in the middle of the third row - they were first formed in 1941 and wear the same badge today, only with the Queen's instead of King's crown. These are the British armored regiments - the armoured corps was organised totally differently - each regular (formerly cavalry but all converted to armor over the 20s and 30s) Armoured regiment was singular, and the reserve (Yeomanry) regiments all had distinct identities. Because of that, their numbers were smaller, and they're consequently rarer and more valuable (especially the Yeomanry) - hence why I have fewer as yet! Because of the reductions in cavalry in the 20s, many of the regular regiments were amalgamated, and many of the Yeomanry converted to artillery units. The one on top is the basic Royal Armored Corps badge, the ones below a mixture of regular and Yeomanry. Of particular interest would be the 17th / 21st Lancers badge, the death's head very similar to the one worn by the SS Totenkopf - awkward at the time, but they'd been wearing it since 1759. Last edited by Nyles; 02-03-2015 at 02:23 AM. 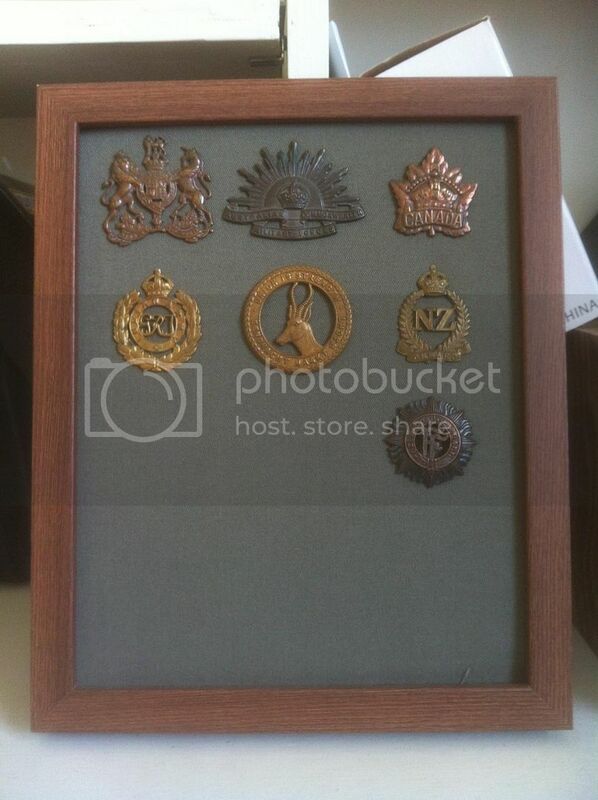 Finally a set of General Service badges for various countries. Read like a book - United Kingdom, Australia, Canada, India, South Africa, New Zealand and Ireland. For Great Britain, India, South Africa and Canada the General Service badge would be worn by troops unassigned to a unit (typically new recruits). 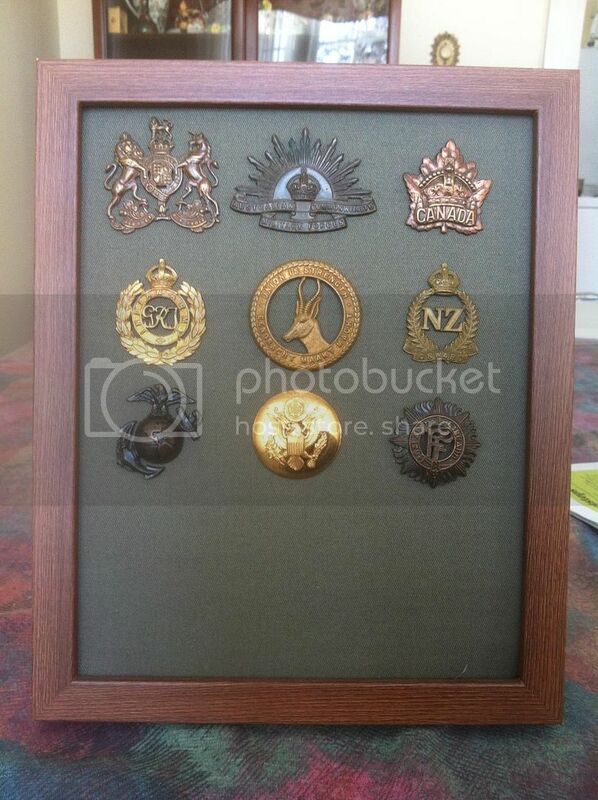 However, Australia and New Zealand, while they maintained militia regiments at home, would raise unaffiliated numbered battalions for overseas service, all of whom would just wear the General Service badge. Ireland only issues one cap badge, an intentional break from British tradition (for obvious reasons - the same reason they were actually neutral in WW2). I also have WW2 US Army and USMC badges in the mail at the moment. Unit patches are popular collector items down here in the states as are medals. My grandfather (passed away July 1, 2013) flew B-17 and B-29 bombers. I have all of his rank insignia, patches from his units that he served with during WWII and medals framed in a shadow box and on display. Articles of clothing can bring a fairly high dollar amount as well anymore. That's a neat collection Nyles. Thanks! Unit patches, particularly Canadian, have never attracted as much interest up here because they tend to be much plainer - case in point, my division (3rd Canadian Division - just stood back up a couple of years ago) wears a 2" x 3" rectangle in French Grey. About the only thing interesting about it is that they haven't been able to issue the patches yet because apparently cloth in that color has been discontinued since the last time the Div was active in 1946. It's good that you have your Grandfather's things - I have what mine kept, but it wasn't a lot. I'd love to see your shadow box. I went to wikipedia to see the 3rd Division patch, and at first I thought someone dropped the ball creatively, and then looked at all the other division patches and realized they were all like that. Heraldy items are kind of my inner shameful secret. I make a big show of not wearing ribbons when I can get away with it, but the history behind the assorted badges and decorations of various militaries is very interesting. Cordell, Pop framed Grandpa's ribbons and decorations when he passed away. I was in the first grade at the time, it took me until the sixth grade to recognize the DSC ribbon and understood what Granddaddy meant when he once described "killing Nazis by the handful" with his BAR. Well, you could still say someone dropped the ball creatively, just at a much higher level! That said I'd still be pissed if they had changed it when they brought back the Divs (which 2nd Div did for some reason) - if it was good enough for 3rd Div when they landed on Juno beach, it's good enough for me now! The Brigade patches on the opposite shoulder are more elaborate, but I belong directly to the Division so I don't wear one. Nothing wrong with a little military heraldry! There's actually a whole heraldic language to Commonwealth cap badges - starting with the most obvious, the crown - during the WW1 / WW2 period most units wore a Tudor Crown, associated with a King - now we were a St Edward's Crown, which is heart-shaped on top, associated with a Queen. However, some units wear a Ducal Coronet (it's only called a crown if it's worn by a ruling monarch) if they're associated with a specific member of the Royal family or nobility - a common example is the Prince of Wales' coronet, which is flatter on top and usually pictured with three feathers. Good example is the Welch Regiment in the center top of the British infantry badges. On a more national level, when badges include wreathes of leaves (a common element), the leaves themselves change - English units wear Oak leaves, Scottish units Thistle, Canadian Maple leaves (of course) and New Zealand Fern leaves. As an example the Royal Canadian Engineers and British Royal Engineers badge is identical except for the leaves on the wreath and the title. -Scottish units usually have either the St Andrew's cross (X shaped) or St Andrew himself holding it - see pretty much all of the big Highland badges on the bottom of the frames! -Lancer regiments wear crossed lances, for obvious reasons. Often you'll also see local heraldic symbols, especially on British badges - the Staffordshire knot, the Yorkshire (silver representing white) or Lancaster (brass representing red) roses, the Manitoba Dragoon's bison. Finally you often see certain symbols used to commemorate important battles in a regiment's history - many British regiments wear the Sphinx for service in the Battle of Alexandria in 1798, or the rock and key of Gibraltar for service in the Great Siege of Gibraltar during the American Revolution. The Royal Canadian Dragoons wear the springbok for their service in the Boer War, and the Royal Winnipeg Rifles were a devil for the Battle of Batoche, where captured Metis rebel prisoners asked "The redcoats we know, but who were the little black devils?". Almost every badge has an interesting element or story behind it, which is why I find the hobby so interesting! It's also a lot cheaper than guns for a man in the middle of costly renovations! I'll take a photo. 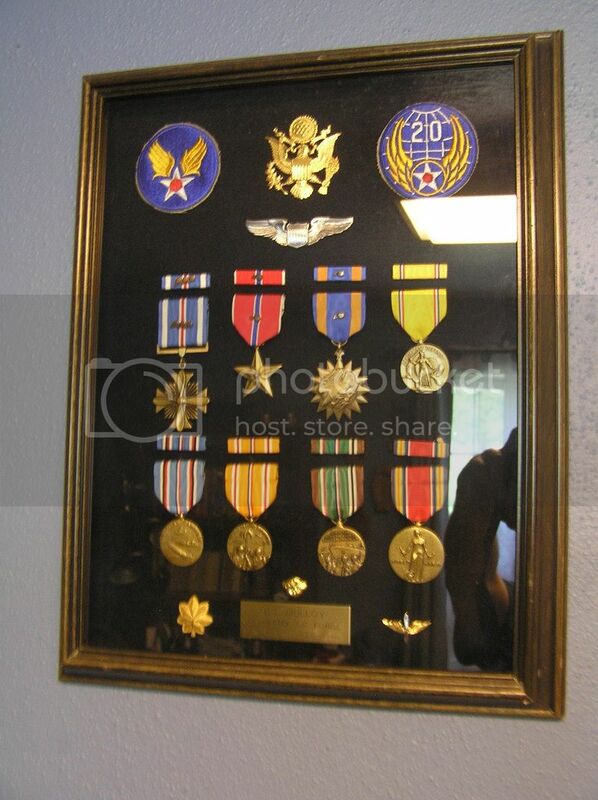 Among the medals are five Distinguished Flying Crosses and two Bronze Stars. Okay well it took longer than I thought, but here are my grandpa's medals from WWII. His highest rank was major. He flew B-17's on anti-sub patrol for the first few years. He flew out of Cape Cod and then Nova Scotia. Transitioned to the B-29 in 44 and flew the bombing campaign against the Japanese home islands in 1945. He flew off of Tinian. He was on active duty from April 1941 - March 1946 Notice he has campaign ribbons from both Europe and the Pacific.